Update balls, strikes, outs, the inning and more and keep everyone in the moment! My son started playing baseball when he was 6. I would sit at the scorers’ table, work the scoreboard, text his grandparents about the game and his progress (in the tradition of all the best baseball broadcasters, I may have embellished a little bit) take pictures and try to keep a scorebook. What I didn’t get to do enough was enjoy the moment. Looking around, I saw there were a lot of other parents texting and taking pictures too. 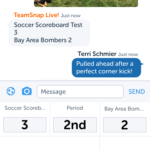 With the score-tracking feature in Live!, Jason is able to stay in the moment while watching his son play and still keeping others updated on the game. About two years later, I joined TeamSnap as an iOS developer. 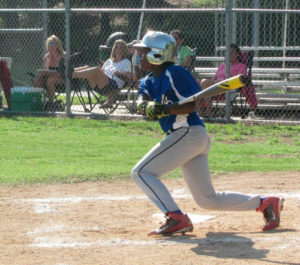 My son was still playing baseball, I was still sending texts to grandparents and snapping pictures, but I had taken a step back and was enjoying the games and the moment. The sidelines were still filled with other parents also texting and Facebooking about the game. I wanted a solution that would let everyone involved—present or not—know the state of the current game, through updates as well as pictures, without being taken out of the moment of enjoying the game. Something as easy—or easier—than a scoreboard (I don’t even remember the last time I was at a field with a working scoreboard) and at least as social as texting/posting to social media. Everyone with TeamSnap Live! can quickly see the current game state at the top of the screen, as well as the inning, the number of outs, the count, the positions of baserunners and the score. First, make sure you have the latest version of the TeamSnap app from Google Play for your Android or the App Store for your Apple phone. Log into your app and click on the Live! game event banner. To set the current state during a Live! game event, either tap the score at the top of the screen or on the baseball icon at the bottom of the screen. Tapping “B”, “S” or “O” resets the current setting, but easier than that, recording an out clears balls and strikes automatically. And setting the inning clears balls, strikes, outs and any baserunners. To follow along, simply log into the app and click on the orange Live Game in Progress banner. We only send out score notifications to your phone when the score changes, but those notifications now include inning and out information. So everyone will know that not only is the score 4-3 but it’s the bottom of the 3rd with 2 outs. 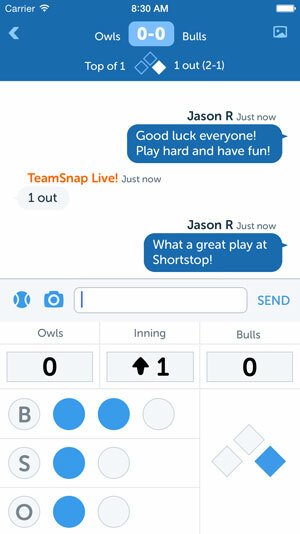 We are all incredibly proud of this feature and TeamSnap Live! We hope it helps everyone stay up-to-date with the state of the game – and more importantly, actually enjoy the moment. Jason Rahaim has been an iOS developer with TeamSnap for two and a half years. He devotes his time to teaching kids about Lego robotics, snorkeling with his wife and son, and building trebuchet pitching machines. He also enjoys disc golf, poker and bad sci-fi.